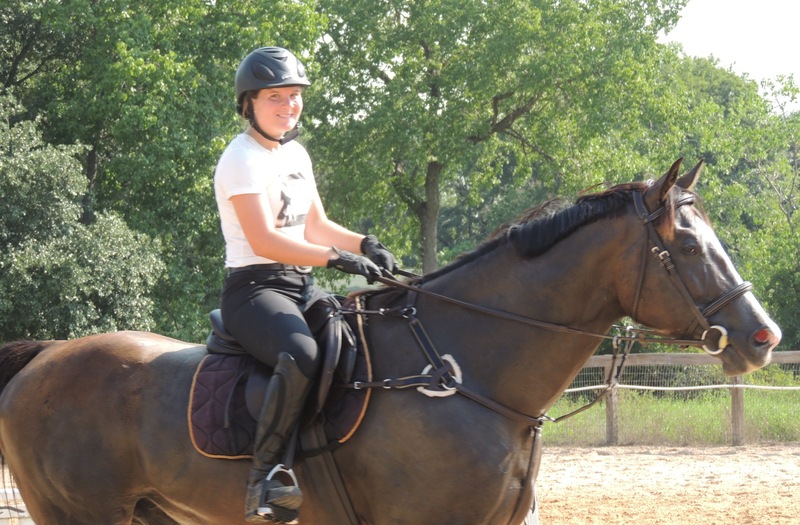 Lauren is all smiles as she rides Bruno at Dev’s today. No story about OTTB Bruno can start without a little history. Almost a year ago, our trainer Dev had a lame horse with soundness issues that he thought we could re-hab and make into a great jumper. We took Bruno home. He had surgery over eight months ago to cure an infection in his hoof. We got way more than we bargained for in terms of care, cost and endless days of stall rest. But we learned an infinite amount about patience, love and hope as well. Today we were finally ready to take the over 17.2 hand, almost 1600 pound thoroughbred back to Dev for his very first lesson as a sound horse. We were all a little nervous as we pulled out before dawn trying to beat some late summer Texas heat. Bruno was already covered in sweat as he stepped from the trailer. Dev’s mom, a rider, judge and horsewoman, looked at Bruno and asked, had he grown? I don’t think he is any taller but he has lost that coltish look and replaced it with a mature, muscled physique. For Bruno to succeed at being a show horse, a jumper, he has to do more than be sound and look good. Today we were going to find out what our trainer thought of Bru, how he did with new places and hopefully how he jumped. Lauren has had problems with the left lead canter. Race horses run to the left. The left front hoof is the bad one. I suspect Bruno remembers running on that foot and pain. It is going to take some time for Bruno to understand his hoof does not hurt anymore. Dev climbed up in the saddle to see if he could make some progress where Lauren could not. Dev had nothing but praise for the big horse. He liked how soft he was, he liked how his strides just ate up the lines to the jumps and I think he was pleased to see the promise in Lauren and gentle horse. It wasn’t all roses as Bruno shied away from the dogs (if they had been poodles he would have been fine) and went sideways instead of forward a couple of times but overall he was great. When it came time for the first jump, we all held our breath but Bruno sailed over like a pro. He doesn’t have all the style of Feather but makes up for it on course by being soft and adjustable. It was a wonderful day, and one I wasn’t sure would ever come to pass even a month ago. A couple old friends showed up to ride, Katy and Hennah with their moms, Vernie and Nargis. It made me grateful for this trainer, these friends and this special horse who has taught Lauren and I so much. After the trailer ride home, Bruno was spotted out with Mickey and Feather at the fence line. I bet Bruno was telling them how he had jumped the zebra line of jumps like a pro. Both Mickey and Feather have jumped that same line higher and faster as they no doubt let him know. But I think Bruno knew something pretty special had happened today. Hopefully, one day his jumps will surpass theirs. Today was a pretty good start! 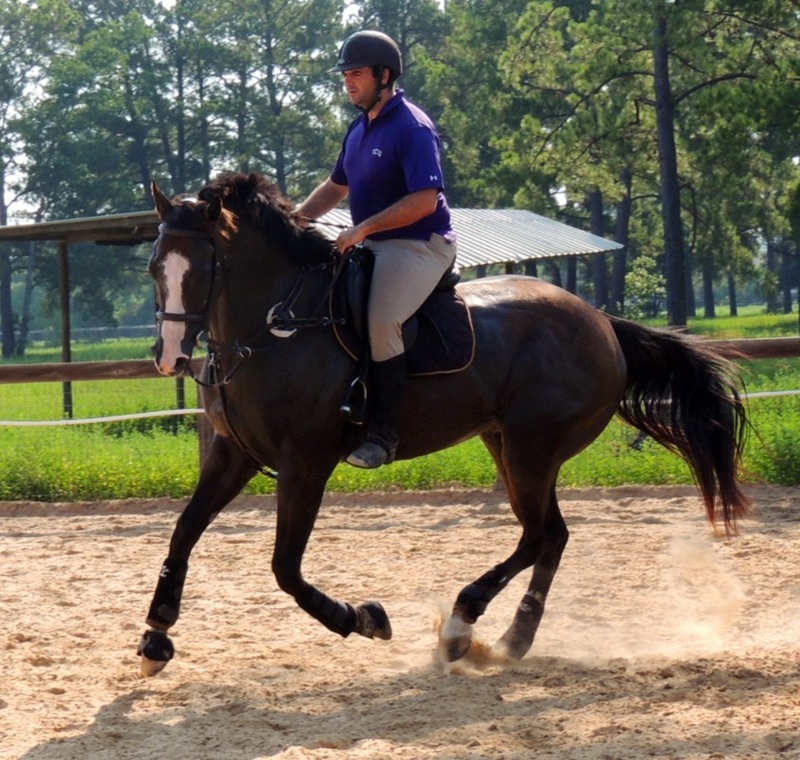 This entry was posted in A Bruno Story and tagged hoof problems, jumper training, OTTB injuries, OTTB rehab, TAMU, thoroughbred training after track by Exechorseluver. Bookmark the permalink. You all have done a wonderful job with Bruno and he is going to repay your kindness and patience with fine jumping and many ribbons. You’re so right–sometimes you struggle with the rehab and the setbacks and wonder if there really IS “a pony in there somewhere,” but in the last analysis, it is all worth it. Lessons learned–experience being the BEST teacher–and more exciting adventures to come. Congratulations, again! Oh my goodenss it has been a long ride and a tough one. But my daughter has learned more about love and life with this horse than possibly she ever will again. She loves this horse to her soul. To see him finally come along is frosting on a full cake this month. 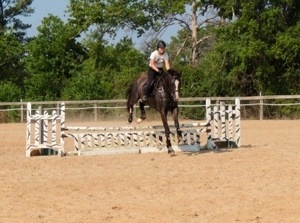 Off-track thoroughbred.com is doing a story about Bruno this week. Pretty exciting stuff. Thank you for always being our champion!! All I have to say to Lauren is “our thoroughbred friend from the desert” wrote and she knows you.